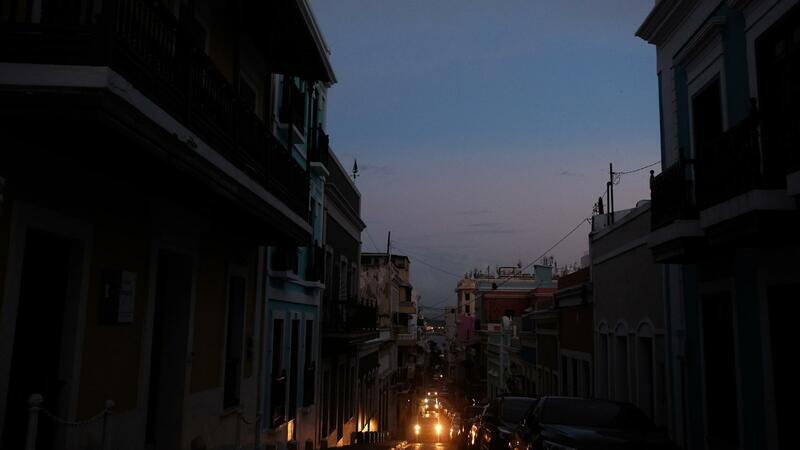 View of Old San Juan, Puerto Rico, on April 18, 2018, after a major failure knocked out the electricity leaving the entire island without power, again. The electricity was eventually restored, but 1.5 percent of customers have had no power in the eight months since Hurricane Maria destroyed the electrical grid. In an urgent letter to the heads of the Federal Emergency Management Agency and the U.S. Army Corps of Engineers, Rep. Jenniffer Gonzalez requested that the agencies extend their restoration contracts on the island for up to 90 days. "Out of an abundance of caution in the face of the upcoming hurricane season," wrote Gonzalez, "I must urge that there be an extension of the mission that allows agency and contract crews to remain in place to see that the system is 100 percent restored." The island's power utility – PREPA — and the Army Corps have said they expect full power restoration on the island to be complete by May 31, one day before the official start of the Atlantic hurricane season. But Gonzalez expressed concern that PREPA does not have the resources to finish the job quickly on its own. Finishing, she wrote, requires enough resources "so that all areas still requiring restoration may be worked on, full-time and simultaneously." A spokeswoman for the Army Corps, which issues the contracts, said, "We work for FEMA. We'll do whatever FEMA wants us to do." The Army Corps began withdrawing its crews from Puerto Rico in March, to the anger of many of the island's officials and residents. But on April 7, the agency also added $140 million to its $370 million contract with Power Secure, the last of its major contractors doing power restoration work. The extension allowed the firm to keep its workers on the island until May 18. As of this week the Army Corps had 1,059 contractors on the island, including nearly 700 people working on power lines. Of the island's 1.5 million power customers, officials say about 23,000 — or roughly 70,000 people — are still in the dark. Nearly all of them live in remote, mountainous areas, in communities where fury and desperation have set in as the start of hurricane season looms. This week residents of one neighborhood in the city of Humacao marched on the streets with torches, demanding an immediate restoration of their electricity.